All the Softness you Want, all the Strength you Need, all at a Value You Love. What makes Angel Soft bath tissue a good value? An Ideal Balance of Softness and Strength. Two SoftShield layers help it hold up. It’s a smart choice for your family and budget. Ancient Rome- All public toilets had a stick with a sponge attached to its end that soaked in a bucket of brine so citizens could have a tool to freshen up with. China Around 1391 AD- The Bureau of Imperial Supplies began producing 720,000 sheets of toilet paper per year. Each sheet measured two feet by three feet! Viking Age- During this time, people would freshen up with discarded sheep’s wool. Late Middle Ages- The French invented the bidet for proper cleansing. 1700s- Colonial Americans used corncobs to cleanse with. However, once newspapers became commonplace, people used the newspaper after they had finished reading it. 1880- The first actual paper produced for freshening up with was in England. The individual squares were sold in boxes, not rolls. 1902- Northern Paper Mills introduces Northern Tissue, made at the Green Bay East Mill in Wisconsin. 1920s- Northern Mills introduced toilet tissue on a roll. 1973- The Great Toilet Paper Shortage occurred in 1973, after a popular evening talk show host made a joke that there was an acute shortage of toilet paper in the United States. The next morning, 20 million viewers bought up all the toilet paper they could find. By noon that day, most stores were out of toilet paper. 1987- Angel Soft is first launched in the United States. 2012- Angel Soft made with SoftShield layers. 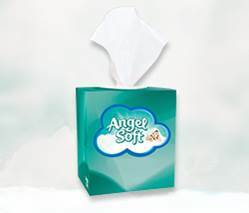 Introducing Angel Soft facial tissue. Angel Soft facial tissue gives you heavenly quality at a heavenly value. It’s the softness and strength you trust at a price you’ve been looking for. Available in lotion and non-lotion. Is the wrapper on Angel Soft Bath Tissue recyclable? Is Angel Soft Bath Tissue septic/ sewer safe? All bath tissue products manufactured by Georgia-Pacific Consumer Products LP are acceptable for use in standard sewer and septic systems. Do you make Angel Soft Bath Tissue with aloe? No, Angel Soft bath tissue is manufactured from only pulp fiber, with no additives. 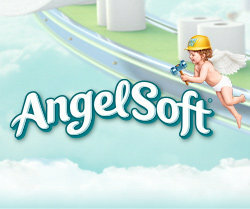 When was Angel Soft Bath Tissue first introduced into the marketplace? Angel Soft bath tissue was introduced in 1987.